Composed for the Volti Choral Arts Lab. In 2008, just in time to register to vote for the presidential election, I raised my right hand and spoke these words at the USCIS office in Philadelphia after a five-year process of immigration from Australia. Only a minority of Americans ever experience becoming a citizen, and the ordeal brings most immigrants mixed feelings. I love this country so much, I have chosen to make it my home, but I still feel love for the country I left behind. I deeply admire the ideals that led to America's creation, although I don't always agree with the decisions and political direction of the government. I wanted the moment when my status as an American was made official to be joyous and inspiring, but the wording of the Oath of Allegiance reminded me that this country's history has at times been fraught and controversial, and becoming an American citizen was not a decision to be taken lightly or without some reflection on the nature of American patriotism. With this piece, I hope to confront audiences with the range of conflicting emotions I saw reflected on the faces of hundreds of fellow immigrants as we intoned these words in unison that day in 2008, and to encourage natural-born Americans to examine the immigrant experience and what we as a country ask of our newest citizens. 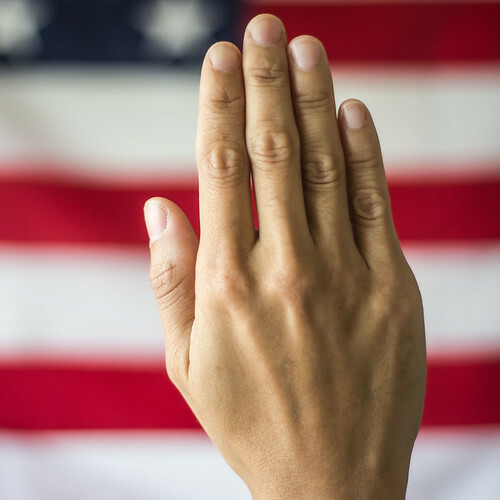 For further reading, I encourage you to see other countries' oaths and pledges of citizenship. The Choral Arts Laboratory is an annual commissioning and residency program, begun in 2003, which is designed to give American composers under the age of 35 the opportunity to work with the professional singers of Volti during the compositional process. The composer is invited not only to create a work for the ensemble, but to develop the composition in a workshop setting. The composer is then given more time to work out issues discovered during rehearsal with the singers, as well as during consultations with Artistic Director Robert Geary and Volti’s longtime Resident Composer, Mark Winges. This collaboration culminates in the world-premiere performances given by Bob Geary and Volti during the regular concert season.